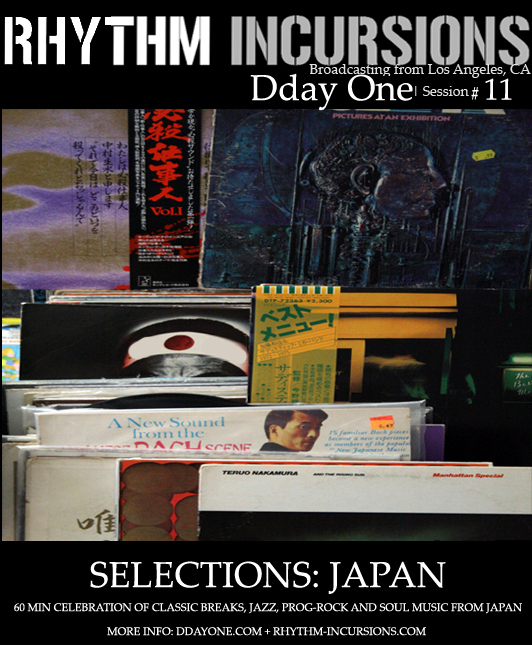 This episode is the first in the â€œSelectionsâ€ mix series. Selections will cover topic specific mixes, for example genre, era and events. This month’s â€œSelectionâ€ is a 60 min celebration of classic breaks, jazz, prog-rock and soul music from Japan. Most of the music featured comes from records stores and supporters on visits to Japan. The most recent visit was early March for Superheadz VJ’s presents “Live Harinezumi No Mori“, then returning home two days before the March 11th earthquake and tsunami. After getting word of the event, days where spent checking the well being of friends in the region and reflecting. This mix comes out those reflections. With news transmitting at light-speed it’s easy to forget but I hope this mix helps to keep those affected by the devastation in your thoughts and prayers. Please join the worldwide assistance drive by directly donating to recognized charitable organization like Japanese Red Cross and Oxfam. To the supporters this mix is dedicated to you! Thanks for being a constant source of inspiration! Heiwa! This entry was posted on Monday, April 4th, 2011 at 8:55 am. It is filed under Podcasts, DDay One - In Session series and tagged with Dday One, Japan, DDay One - In Session series. You can follow any responses to this entry through the RSS 2.0 feed.